Today OSEA is having a great Labor Day Sale that I thought some of you would like to take advantage of. OSEA is one of my favorite brands for effective vegan & natural skincare. Get a FREE mask of your choice with your $125 or more order. That's a $48 value. OSEA has 3 masks to choose from, the White Algae, Red Algae & Black Algae. Once you have $125 or more worth of products in your cart you will be given the opportunity to pick one mask for free to add to your cart. *Sale ends September 4th at 11:59 pst. Since I have tried all three masks I can give you a quick review of them. This mask is my favorite from OSEA, it's for normal, combo & acne prone skin. As stated on their site, this mask is a "complexion refining masks that purifies & decongests. It's one of my go to products when I have an invasion of pimples. I see results as fast as the next day when used over night as a spot treatment. Leaving it overnight is the best way to use it because it works all night to kill the unwanted visitors but used twice weekly for 10 to 20 minutes works great too. I love how this mask smells, very fresh and clean with the thyme, tea tree, and juniper oils. This one is my second favorite, it made to plump, tone & brighten the skin and it's suited for all skin types. I love it because it does all that it says it will do in just one use. I use this mask when my skin needs a little pick me up, every time I use it my skin looks 10 times better. This mask goes on like a moisturizer and also leaves my skin feeling slightly moisturized after removing it. I just recently got this mask and have only used it once, so I can't really say much about it yet. The Black Algae mask is a detoxifying 2 in 1 mask & exfoliant, suited for normal, combination & blemish prone skin types and NOT for sensitive skin. The jojoba beads in this mask are meant to exfoliate manually and the fig, pineapple, pumpkin give an enzymatic exfoliation. From the one time I have used this, I can say that I did notice smoother skin. 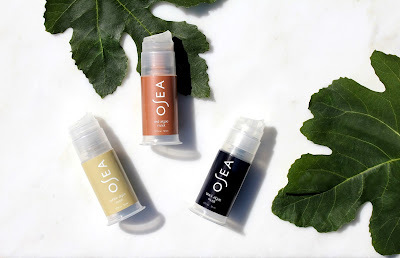 Hope this post helps you decide which OSEA mask is best suited for your skin. P.S Remeber to shop cruelty-free!